The Ornate Wood turtle (Rhinoclemmys pulcherrima manni) is a common freshwater turtle that lives in a variety of aquatic habitats across North America. Although individual wood turtles do not always remain in one aquatic environment throughout a season, habitats that can provide them with more suitable resources for survival are more likely to have greater population densities of turtles. Adult size: 5-8 inches, and lifespan: 30+ years. Ornate wood turtles do vary when it comes to their shell patterns. Ones from Nicaragua apparently lack the bombastic shells that those from Costa Rica have. These turtles are well-tempered and very sociable as well as intelligent. They are extremely personable turtles and can be easily hand-fed. Another type of turtle that is known to be located in tropical regions is the Olive Ridley Sea Turtle. Ornate Wood Turtle prefer to be fed in the water, but will typically accept food over a dry surface too. Rinsed and dried plant matter such as romaine lettuce, dandelion, squash, sweet potatoes, corn and apples should make up 80% of the diet. The remainder should consist of proteins like turtle pellets, earthworms, and crickets . Dust food with vitamin supplement and calcium supplement. As a rule, a growing juvenile's food should be dusted more often than an adult's. Consult product labels and outside literature for specific instructions on supplementing. Avoid over-supplementing. Reproduction may occur throughout the day, but most often attempts are made in the early morning hours, before the heat of the day. Females lay their eggs in sandy bars along rivers and other gravel areas (driveways, roadsides, borrow pits) in June. Ornate turtles are typically found basking in the sun by rivers and streams in spring; along roadsides in June & July (when females are up laying eggs) and August & September (when travelling to overwintering sites); swimming in waterways, or walking through nearby woods, in the spring, summer, and fall. 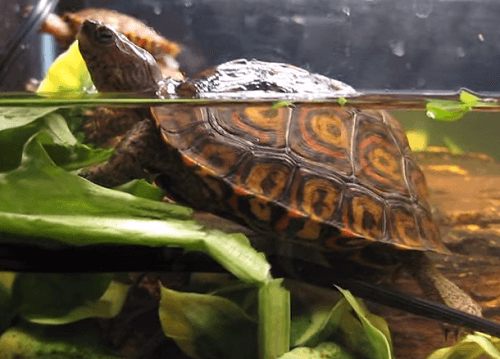 The Ornate Wood Turtle is better suited for a wide, long pen covered by a screen top, rather than an aquarium tank. If it is kept in a tank, the minimum size should be 120 gallons. Ornate wood turtle spend time of every day in water, so the habitat must be semi aquatic. Use chlorine-free water (not tap water) in the swim area. At its deepest point the swim area should reach about as high as the top of the turtle's shell. The enclosure’s temperature should be between 75 and 82 degrees Fahrenheit, with a basking area in the mid 90s. Cool enclosure to room temperature at night, but remain above 60 degrees. Thermometers should be placed in the water, about two inches over the surface of the dry area substrate and in the basking area. What next? Check out the links below!